As the PS4 ages we can expect to see many special editions. 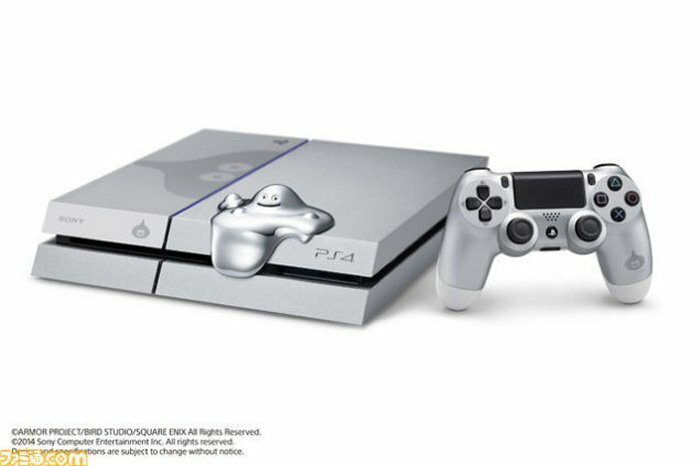 Among the first will be this Dragon Quest Metallic Slime Edition of the Sony PlayStation 4, which looks shiny indeed. It is in honor of the release of Dragon Quest Heroes. Sony has announced that they will be releasing a special edition PS4 to commemorate the launch. The entire console and controller are metallic silver. Not only that, but as an added detail, there is actual “slime” that looks like it is oozing over the edge of the console. It actually makes the console look pretty cute and I love the metallic look. The slime is basically a USB cover that can be attached and detached from the console itself, but aside from that, it just adds some unique flair to this console. This special edition console is expected to go on sale next spring and will be released alongside of the game. We don’t have any pricing info yet, but that detail will come in due time. We also are not sure if this will be a Japan exclusive or if it will be available elsewhere too. It should be a hit with fans of the game at any rate.